Anyone who’s ever taken a bite of a well-made pound cake won’t soon forget the experience: spongy and soft, yet moist and slightly dense. It’s taste isn’t as rich or overwhelming as other confections, but it’s still deeply satisfying, earning it a worldwide reputation. In France they call it quatre-quarts. In Mexico, it’s panqué. If you’re an online pastry student who hasn’t yet forayed into the world of pound cakes, get ready: This is your crash course in one of the most simple and revered pastries. The name “pound cake” comes from traditional recipes whereby a pound of each of the four main ingredients – flour, butter, eggs and sugar – is incorporated into the pastry. The French quatre-quarts (literally meaning “four quarters”) is similar in that the cake uses identical portions of each of the four main ingredients. Traditional pound cakes are typically presented either as loafs or in a Bundt shape, and served in vertical slivers, more like sliced bread than cake. While you’ve surely come across many a pound cake recipe in your culinary meanderings, the old-fashioned pound cake contains only the main four ingredients of flour, butter, eggs and sugar. Some bakers might also add salt, finish with a dusting of powdered sugar and serve alongside whipped cream and strawberries. Any additional fixings would be seen as a heresy to pound-cake purists. Naturally, this means that a traditional, by-the-book pound cake is somewhat difficult to get just right. The texture, density and moistness of the cake need to be spot on since there are no added flavors or frosting to mask any deficiencies. If you go the classic route, we recommend checking out this recipe from the Stay at Home Chef. The key is to beat the butter until it’s light and airy. Next add sugar and whip the mix for at least a minute. Then add one egg at a time, beating each into the solution before adding the next. Finally, you can begin introducing the flour incrementally, beating as you go. 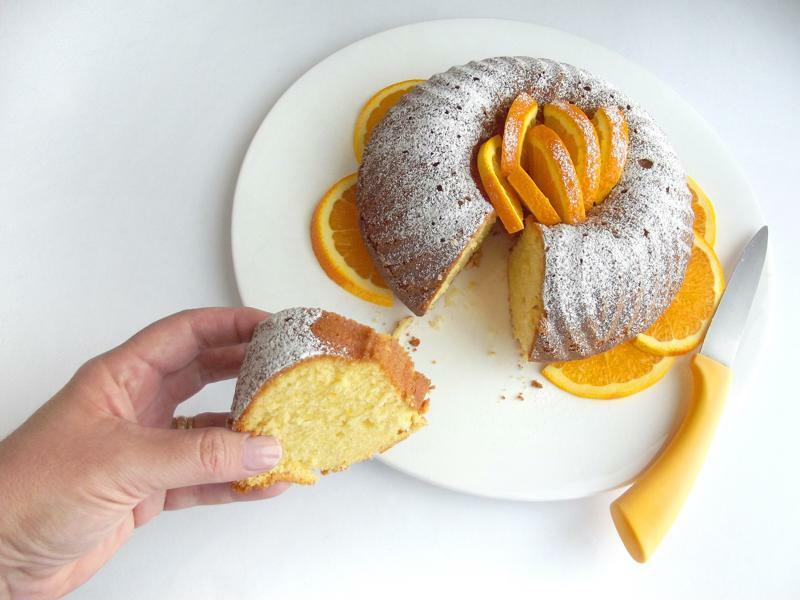 There’s more than one way to serve a delicious pound cake. Of course, what’s the fun in sticking to plain pound cake when there’s just so much room to experiment and improve? There are plenty of more forgiving and more exciting recipes to liven up what, for some diners, is an otherwise boring dish. For starters, we recommend this marble pound cake recipe straight from Escoffier’s baking and pastry program. Technique and timing are of the essence when mixing in the main ingredients, so we suggest following along with the step-by-step video instructions. But to give you an idea of what’s involved, you would start by beating the butter and sugar together before mixing in the eggs. We then add a step, incorporating a cup of sour cream to create flavor depth. Next, we add the flour along with a small amount of baking soda to help it rise. To get the tantalizing marble effect, fill a loaf pan with about an inch and a half of the plain batter, followed by a second batter that’s identical except that it incorporates 6 ounces of melted chocolate. This second layer should be about a quarter-inch thick. Carefully swirl the two layers, and then bake at the right time and temperature. The marble pound cake is certainly a delicious alternative to the classic, but don’t stop there. Consider experimenting with this rich caramel apple pound cake from Delish. Check out this lemon poppy-seed pound cake recipe, covered in a rich glaze, courtesy of Preppy Kitchen. In some ways, the pound cake is the canvas of the baking world. Go crazy. You’ll surely have fun experimenting, and you might just create something new and unique that your customers will crave enough to come back for more.